As the owners of two dogs (Pip and Oscar) who are spoilt rotten, a continuing frustration for Mrs. SF and I (mainly me if truth be told) is the lack of places to eat and indeed to drink in Cardiff that accepted our furry friends. There is nothing nicer after a good long walk with the dogs than a drink (alcoholic or otherwise) and a bite to eat, but with the dogs in tow we are not always welcomed. Living in Llandaf, we are lucky with the Malsters and the Butchers Arms and Black Lion all being doggy friendly to a degree (welcome in some but not all areas – which is fair enough). We also have the Cricketers in Pontcanna which is close to the parks we tend to walk our dogs in and the always good Lansdowne in Canton. There are slim picking for doggie owners (as far as I am aware) in the City centre itself (Brewdogs being true to its name and the Urban Taphouse notable and very welcome exceptions). On this basis, a walk with Rachel (the poor sod who sits opposite me in our open plan office) and her family in the lovely Cosmeston Lakes Country Park in Penarth one Saturday presented the opportunity to try out (after the walk) the “Doggy Dining” offering at the Blue Pelican Cafe in Penarth, which is located within the Hamptons gift shop. 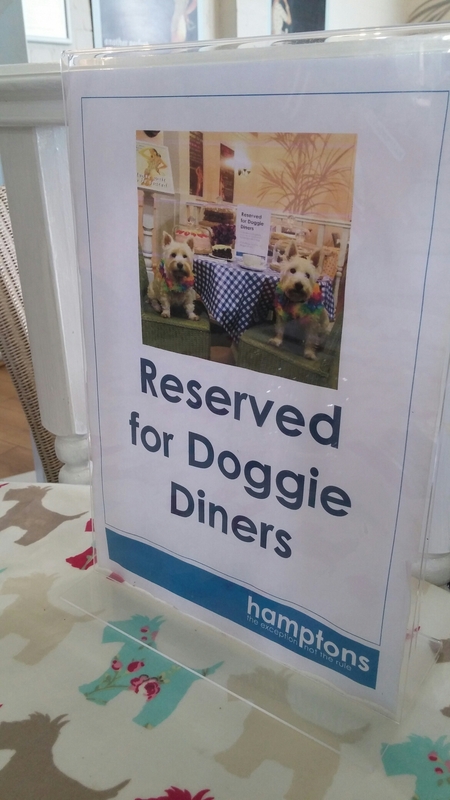 The owners of the Hamptons, being dog lovers themselves (they have a gorgeous pair of Westies called Millie and Georgie, collectively known as “the Girls”), have set up special tables (just outside of the main cafe area) within the Blue Pelican Cafe which are reserved, as they put it, for “doggy diners and their two legged friends”. 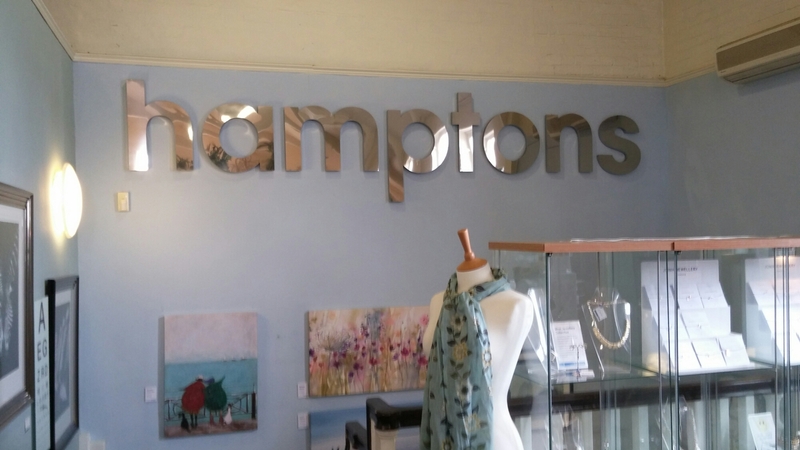 Within the rather lovely Hamptons (a shop full of nice things), the cafe is on the first floor up some stairs (they have a lift as well) at the back of the shop. It has a sort of New England feel to it which is quite nice. The camera on my phone was playing silly buggers on me on the day in question so no picture, despite me taking (or so I thought) three specifically of the place. and soups, salads and hot dishes. I decided (on Rachel’s recommendation) to go with the Lifeguard’s Lunch Box (£9.50). 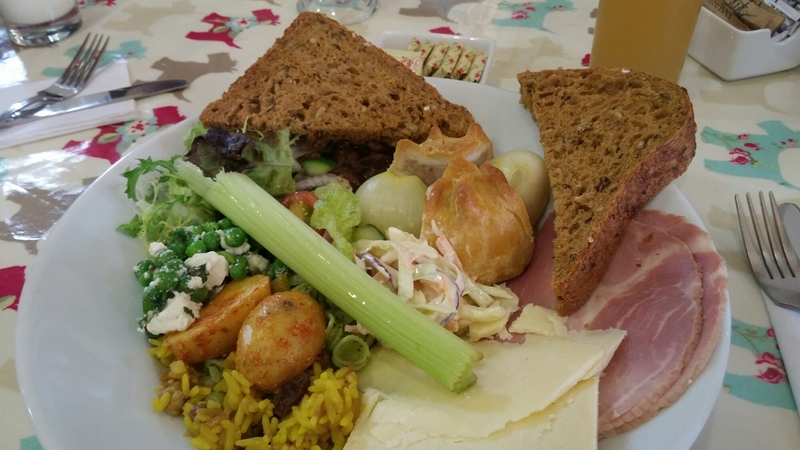 This was described as “a hunky platter of honey roast ham, Welsh Cheddar, pork pie, pickled onions, apply chutney, celery, crusty bread and a selection of salads”. Now what is not to like about that selection of goodies (with the added bonus of readily available titbits to surreptitiously give to the doggies). The star of the show here was the selection of salads These, included a lovely pea and feta combo, a mild but nicely spiced rice and raisin salad, a good (not overly creamy) coleslaw and a sort of bombay’d potato. The cheese was a slab of mature cheddar with a nice sharp tang to it. A decent portion of proper (rather than plastic) ham added nicely to the mix as did a good apple chutney. 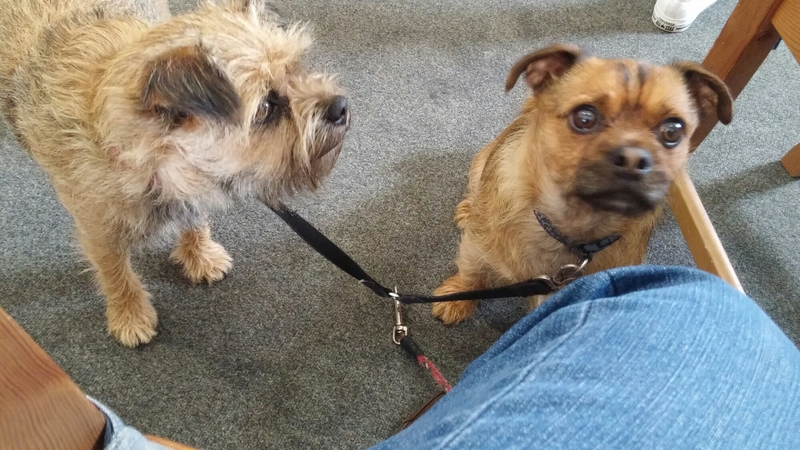 The only slight disappointment was a somewhat pedestrian pork pie (the dogs had most of that). Rachel had the Charleston chicken (£6.99), a wrap filled with breaded chicken goujons and cajun flavoured mayo. This came with the same selection of salads I had with my dish. She ate this with almost indecent speed (probably worried, rightly so that I would nick some, hence no photo) and pronounced it very nice after she had practically inhaled it. 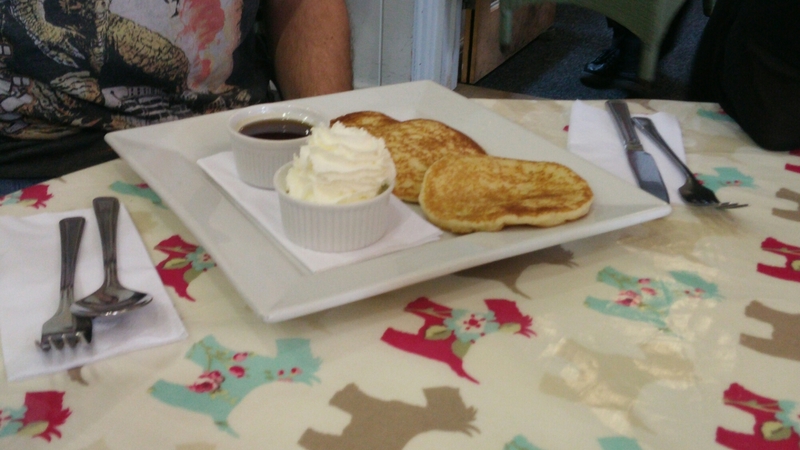 Fraser, her husband who is quite possibly the fussiest man (food wise) on the planet and who regards tomatoes as evil, went for American pancakes with maple syrup (£2.99) which looked very nice. 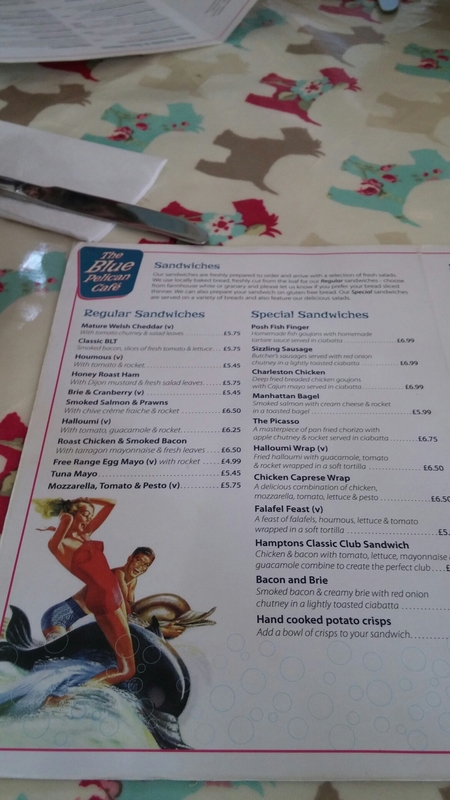 They have a menu for kids, if you have these rather than dogs, with Rachel’s son having a decent sized portion of beans on toast (£1.99) which included proper rather than plastic bread. They have a short offering on the wine front, which is perhaps a tad limited in ambition (with one sauvignon blanc, a merlot and two pinot grigios, plus a couple of fizzes) as well as a few beers and ciders (it would perhaps be nice to have something local on the beer front and something with a little bit more pizzazz on the wine front). 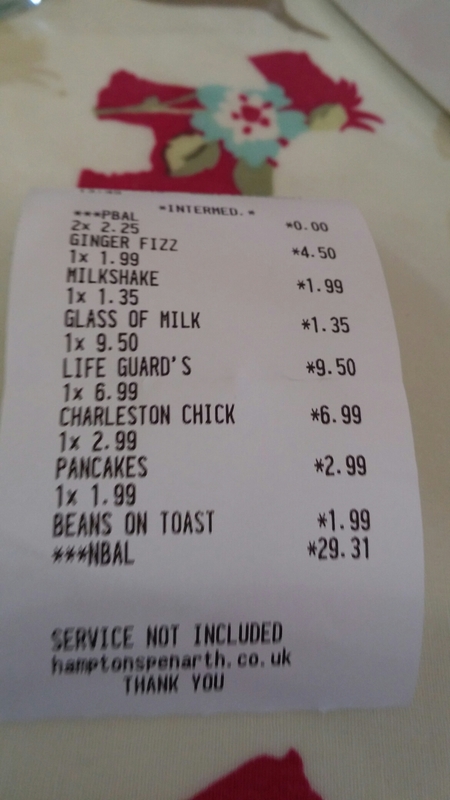 The focus (and, as I was driving, what I was interested in) is, however, really on the soft and hot drinks. They have a good selection over and above boring old coke, including shakes and smoothies. On the hot drink front, it is nice to see a decent selection of teas and coffees as well as a few interesting variation on a theme (orange, as well as after eight mint) in terms of hot chocolate for those with a sweet tooth. 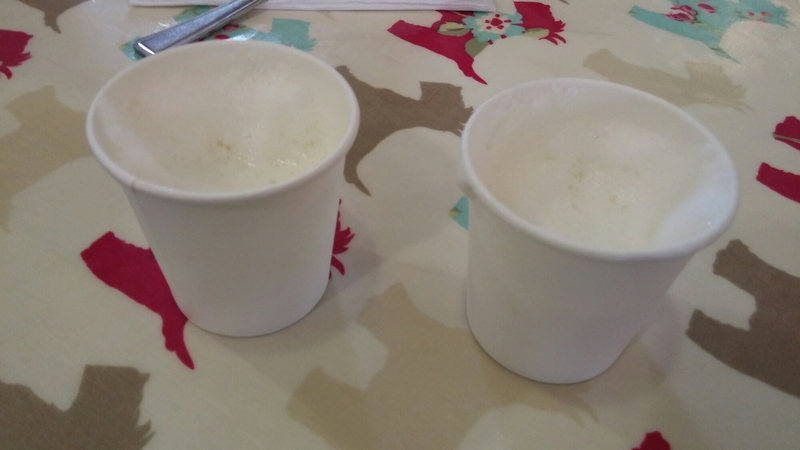 I eventually went for an elderflower and ginger fizz (£2.25) which went down a treat. Very refreshing, with just the right balance of sharp and sweet. 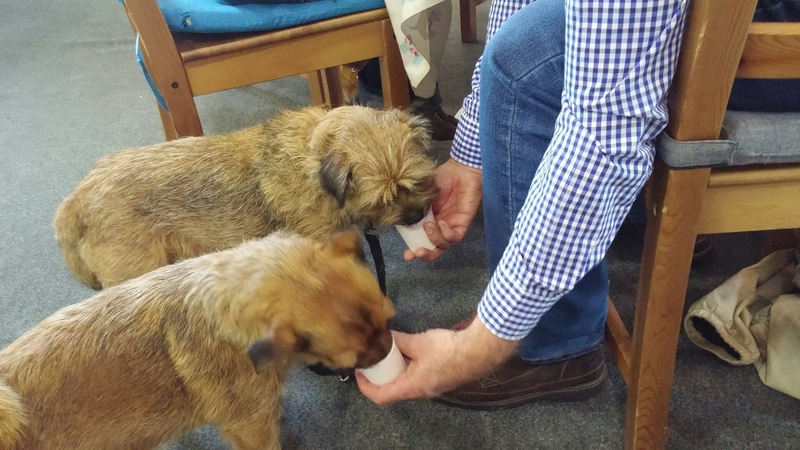 which they very much enjoyed, with Pip also eating much of the paper cup it came in after she had quickly demolished what it contained. Water was also available for the dogs and on our departure they got a couple of doggy biscuits each. They were very happy about that. 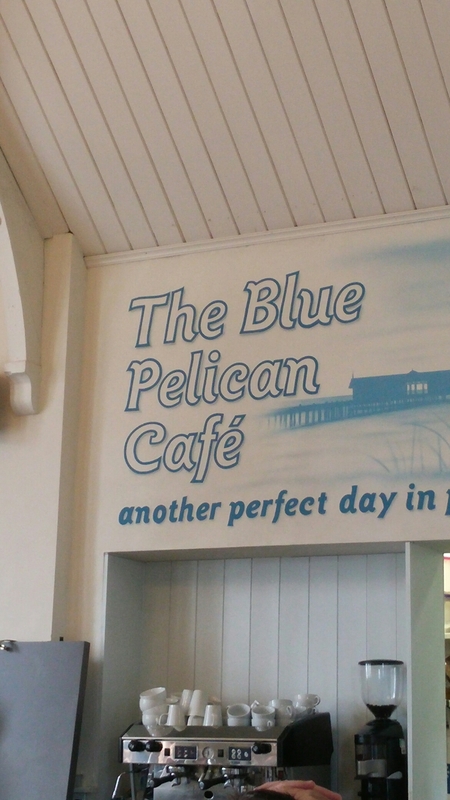 An excellent lunch is to be had at the Blue Pelican Cafe, with well flavoured hearty dishes. You will not come away from this place hungry that is for sure. For me the massive added bonus is how much they love and cater for dogs. My doggies were treated as pampered guests and absoutely loved it. This place really is a must for those with dogs in tow. The damage for 3 adults, 1 child and 2 doggies was just over £29 (ex tip). I thought this good value. 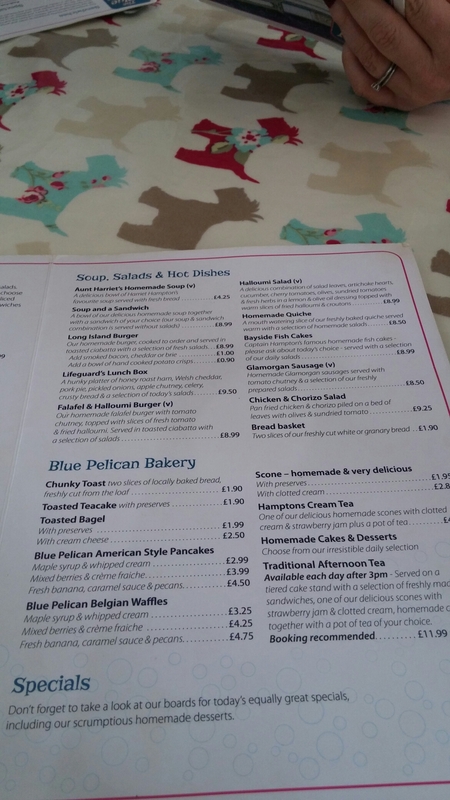 I even managed to pick up a last minute birthday gift for Mrs. SF (they do the most amazing gift wrapping service) in the Hamptons gift shop that the Blue Pelican Cafe is part. Now that was a result. Would I go back? Definitely – good food in a doggie friendly environment is a real boon for a dog owner like me. 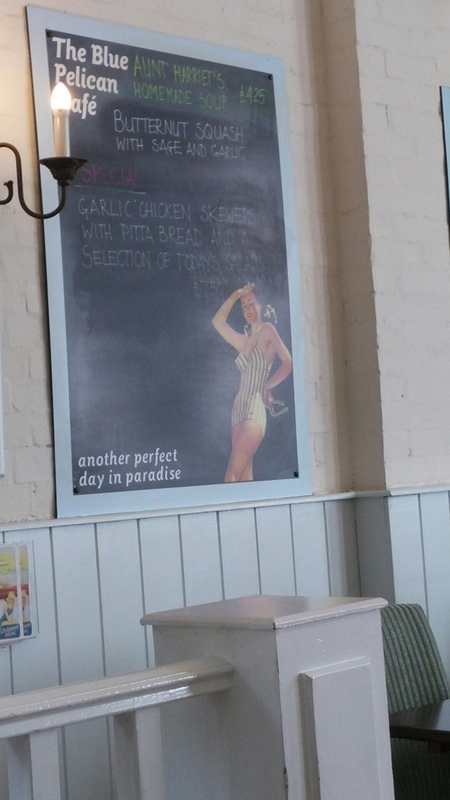 It is no surprise to me that they won “Best Cafe” at the Cardiff Life Awards 2014. Richly deserved for what is a great little place. Please note bookings are not generally taken, other than for their afternoon teas. Mon – Sat: 9 am. – 5 pm. 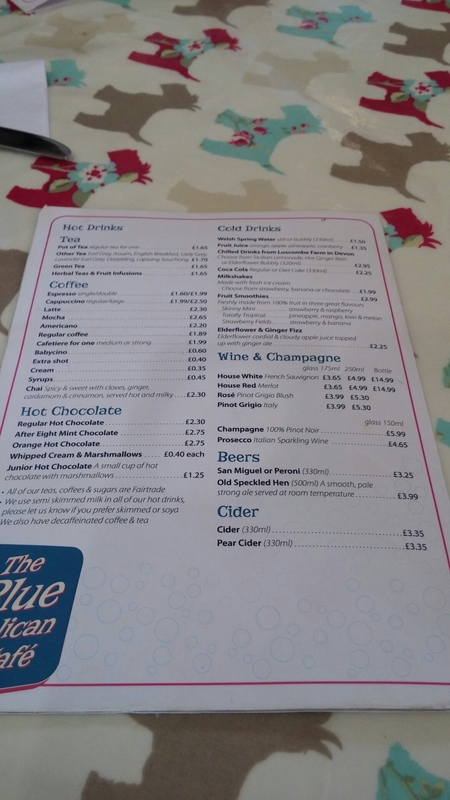 This entry was posted on Sep 20, 2015 by solicitingflavours in Alcoholic drink, American food, Beer, Blue Pelican cafe, burgers, Cafe, cake, coffee, dog friendly, Drink, Food, Food and wine products, Hamptons, lunch, lunchtime, Non alcoholic drink, Penarth, Restaurant Review, review, Sandwich, Tea, Wales.